Many of our beers conform to the “Reinheitsgebot” or German beer purity law which states that beer can only be brewed with four ingredients: water, malt, hops, and yeast. All of our beers are unfiltered and naturally carbonated. Our flagship beer, inspired by the fest beers of Germany. This rich amber lager has a smooth malty flavor, and finishes refreshingly clean with balanced hop notes. We lagered this brew for 60 days, spending 4 weeks at 28 degrees Fahrenheit. Beautifully light and refreshing, Hera Pils is a traditional Czech-style Pilsner. Crisp and clean with delicate hop flavor, this lager is as elegant as the goddess herself. Doppelbock literally means double bock bier. Standing at 7.5% ABV, this full-bodied lager was designed for the colder days and a cozy fireplace. This beer required three batches of grain to achieve its hardy and complex flavors. A bold Doppelbock-style lager brewed with Allspice and cranberry, giving this beer a touch of spice and tartness. Clocking in at 10.0% ABV, this sipping beer is a wonderful was to enjoy the colder evenings of the season. We currently have LTN on draft that has been barrel-aged with a blend of Buffalo Trace whiskey and grape brandy. Brewed for a lighter grainy sweet body and Saaz hops for a spicy crisp finish. Not your typical pilsner! We experimented with adding real Orange Blossom Honey and found ourselves with a light-bodied pilsner that is dry and crisp, but still has a hint of honey sweetness and a touch of flowers on the nose. This brew's grain bill is comprised of 50% white wheat malt and 50% malted barley. The ale yeast allowed this beer to develop traditional fruity, sweet flavors, including banana, vanilla, and clove. It has a strong head to be showcased in a tall glass. The Pianist is a kettle sour brewed with sea salt and lime peel, making it a refreshing sour ale. This Imperial Stout is brewed using a polygyle technique, where we take the wort from one batch of grain and infuse it a second time with additional malt to increase the amount of sugar and body, bumping the ABV past 10%. Aged on oak, this is a big and bold, yet drinkable, stout. A rich, dark stout brewed with lactose and rolled oats, featuring strong notes of coffee and chocolate, with a clean finish. With a focus on sessionability, we took fermentation strategies from lagers and applied them to this ale. The old world brewing of this beer would typically result in a KOlSCH, but because of our hopping techniques, the result is a session IPA. Our Farmer's Fresh Session IPA gets even juicier with the addition of grapefruit for an extra citrus kick. This brew is light, hoppy, and refreshing - perfect for summer sipping. Bursting with Simcoe, Citra, and Mosaic hops, our IPA packs a punch of tropical hop goodness in a glass. Even at 7.0% ABV, Fresh Pick is extremely drinkable and refreshing. This is a full-bodied IPA with notes of lychee, white grape and honeydew, with balanced bitter dankness. This unique style of smoky lager features campfire aromas and smoked, meaty flavor. Luckily for vegetarians this beer’s meaty flavor comes from beech-smoked barley malt from Bamberg, Germany, not meat! We offer samples, pints, and growlers and cans to take away. We will feature live music every Thursday-Sunday. To find out who is playing, check out our Events page. 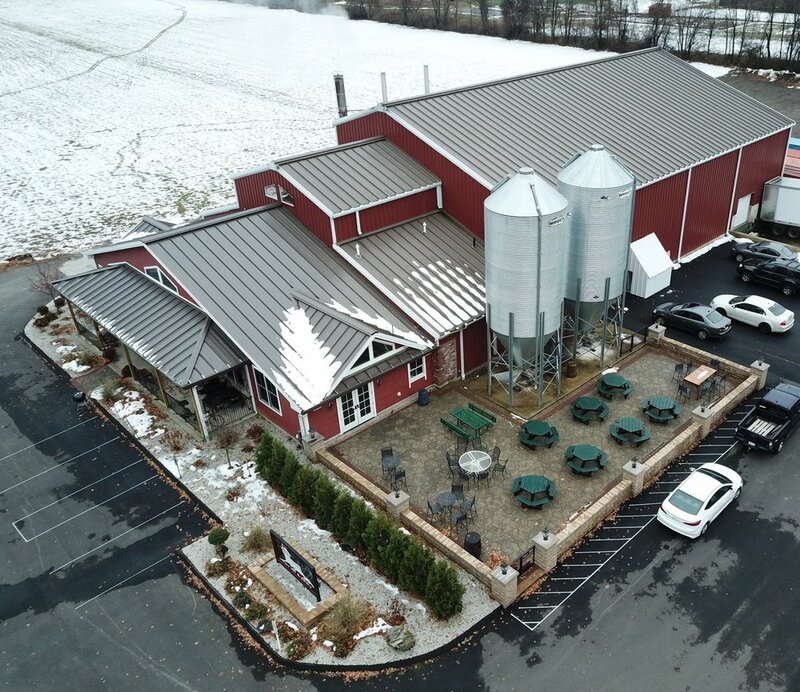 While the brewery does not serve food, you are welcome to bring your own food to the tasting room! Children are welcome at the brewery. However, they must be closely supervised and not allowed to run around the brewery, the parking lot or the adjacent field. Yes, we are dog-friendly! However please make sure your friendly pooch is on a leash.